Most people live their lives drinking coffee every morning and few stop to think about where their precious beans come from. Most coffee beans come from Coffea arabica, while few come from other species such as Coffea canephora (robusta). The name of Coffea arabica gives a straightforward hint as to it's origins, the Arabian peninsula, of course. The plant itself looks like a tall shrub but many consider it a tree as it can grow over 30ft tall. Similar to the tea plant, commercial coffee growers often prune down to as low as 6 feet for easier cultivation. Coffea plants can't survive sub freezing temperatures, so they are best cultivated in tropical or subtropical regions. Those who wish to grow coffee in a greenhouse are in luck, coffee plants in greenhouses thrive, and can even put out beans! 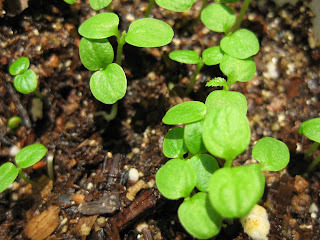 What I find interesting about this plant is the fact that as seedlings they grow fast, sturdy, and close together. 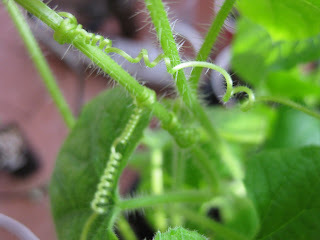 This allows for braiding of the stems when they are young. 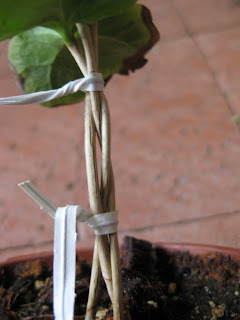 When they mature the trunks of five or six plants become intertwined making a very cool braided effect. Once a coffee plant is a few years old it will begin to flower profusely with many small white flowers coating the branches. Next comes the formation of coffee beans which come from small red berries on the plant which are collected, fermented, dried, and then roasted to create the drink that so many people depend on. 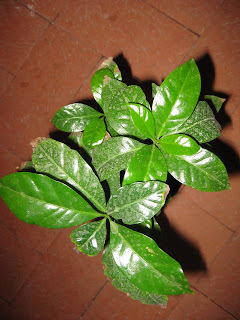 These are my Coffea arabica seedlings; they're inside my house near a south facing window so they can get some sun, and they are growing quite a bit. These are my seedlings that I have tied together in attempts at creating braided coffee plants. Be careful if you choose to do this with your plants, think ahead and plant the beans very close together so you don't have to do any transplanting. 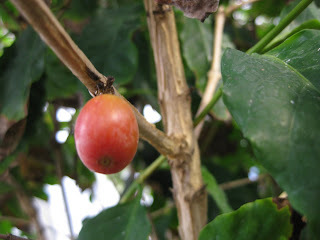 A lone Coffea berry on a Coffee tree. This picture was taken in the Tucson Botanical Garden's greenhouse. 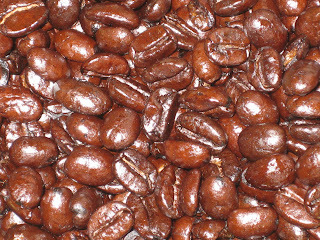 These are some French Roasted coffee beans from the arabica species. Most of coffee's flavor lays in the roast, I'll leave the science of roasting to the professionals. Cucumis metuliferus is more commonly referred to as kiwano, horned cucumber, and horned melon. Its names suit its appearance; a melon-like fruit with large spikes all over. It's a vine native to Africa that bears spiny edible fruits. 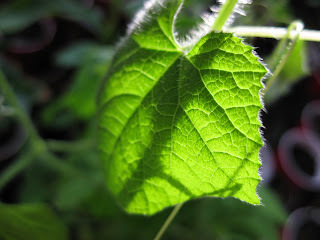 It is in the cucumber (Cucurbitaceae) family and doesn't look too far off from a cucumber. This is an annual plant that is great for growing in the garden, especially against a fence to let it climb. The plant can't survive cold temperatures so it is best grown as a summer crop. 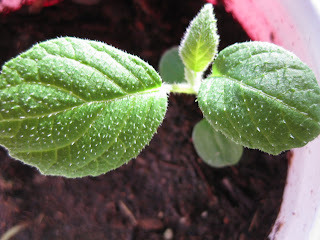 If planting outside, the seeds should be sown after the last frost or in spring. These don't make good house plants because being an annual, they demand a lot more sunlight than a window can provide. While the plant itself isn't very aesthetically pleasing, the fruits are. They usually have red, yellow, and green streaks. Where can you buy horned melons? I would recommend high-end grocery stores, or specialty grocers that carry a wide variety of fruits. I am unaware of anywhere that sells seeds or plants so your best bet is to buy a fruit and plant the seeds. Not many people like the taste of horned melons, but I would recommend that you at least try one. To eat a horned melon, you should cut it in half and scoop out the inside with a spoon. You will notice that the fruit has hundreds of jelly-like portions, inside of which you will find a seed. The seeds are edible, but if you want to try your hand at planting one, you must first remove it from the surrounding gelatin (not as easy as it sounds). If you dislike the taste, try sprinkling some sugar on it. This picture is a good example of the horned melon's climbing potential. You should allow the plant to climb up a trellis or fence rather than spread out on the ground. This will protect your fruits, save space and make harvesting easier.